EXPERIENCE – Page 2 – Go There. Try That. This blog is about celebrating new experiences and trying new things. Well, this time, trying a new experience means facing one of my biggest fears: heights. Yep, I have a real fear of heights. . . a real fear of heights. In fact, I’m starting this post a week before the actual event because I am already nervous! I have to write about it to gear myself up for it! What am I so nervous about? Getting on the SkyStar (which I am affectionately referring to as the wheel of death). Normal people refer to it as the largest mobile observation wheel in the U.S. I mean, I love admiring it. I think it’s a beautiful addition to the Cincinnati Banks. It’s a glorious site at night. In a way, I both love the SkyStar and fear the SkyStar. I love it from afar! But, Friday night, February 8th, I’m getting on it in spite of my fears! I don’t care who you are, that’s HIGH! Since I’ve already been worrying about it for a week, I’m going to dig up a photo of me riding a Sky Lift in Gatlinburg, TN. I so didn’t want to ride it, but, because I suffer terribly from FOMO (fear of missing out), I wanted to share in that experience with my friends. As I waited in line, my heart was thumping, my palms were seriously sweating, my breath was failing, and my mind was racing with “what if” scenarios that all resulted in death or mutilation. But, I got on. Barely. But I got on. Sky Lift in Gatlinburg, TN. Sometimes I make myself attack my fears, even through tears, because I don’t want to give into them. So, I am once again, hopefully, going to tackle my fear of heights by getting on the Cincinnati SkyStar Wheel. Here we go! This is me almost ready to board; I’m terrified and thinking of back out! View of the Banks, Smale Park, and the Ohio River. View of downtown and the National Underground Railroad Freedom Center. View of the Roebling Bridge (my favorite) and the river as the sun starts to set! Seeing the skyline and riverfront views of Cincinnati and Kentucky is simply incredible. My amazement of it all slowly eased my discomfort and allowed me to settle in. I kept looking out and not down. Watching the sun slowly set over Cincinnati at 150-feet? Worth smacking your fears in the face! Am I proud I did it? Absolutely! Will I probably be scared the next time? Absolutely! But I’m feeling pretty confident there will be a next time. The ride is just too impressive to miss. It’s a one-of-a-kind, 12-minute, four full revolutions experience. And when you’re done, grab a bite to eat at local restaurants like Yard House and Taste of Belgium, both right next door. Can’t beat that as a Cincinnati night out. How can you ride for free? Comment on this post and share either a fear you’ve attacked, or a fear you want to attack and you will be entered to win four tickets to ride SkyStar! GO THERE (SkyStar)! TRY THAT (purposefully facing your fears)! As you know, I enjoy playing tourist in Cincinnati! Even though I’ve lived here close to 17 years, I’m constantly discovering new places and new pieces of history. Over the course of our two-hour pedal tour, we experienced, up close, incredible urban masterpieces. 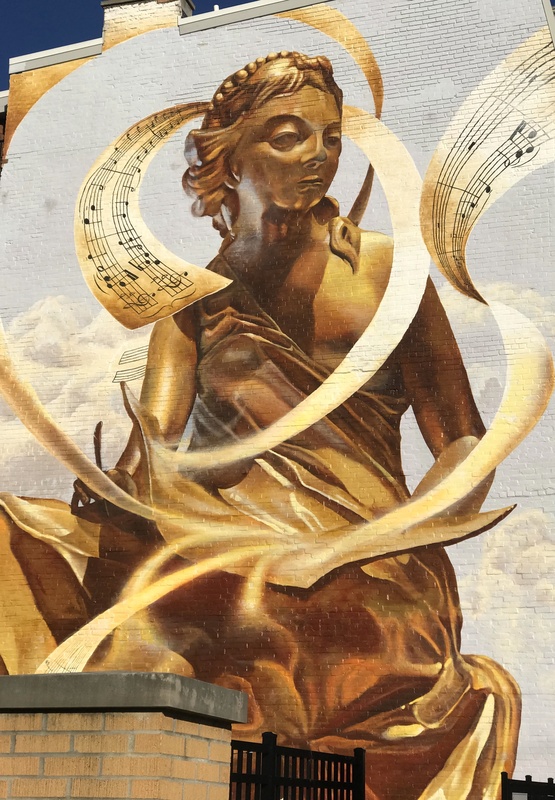 If you’ve driven around downtown at all, you’ve likely caught a glimpse of these murals out of the corner of your eye. The Pedal Wagon Mural tour provides a chance to see, and hear, in detail, about the creation of and images within these pieces of art. Part of what really struck me was the variety of art. 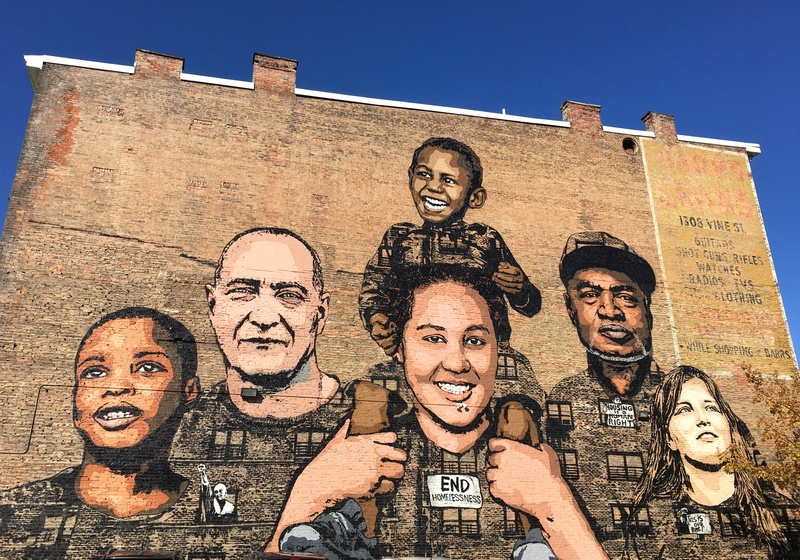 As you can see in the pictures, some murals are lighthearted and colorful while others speak to social and political issues. 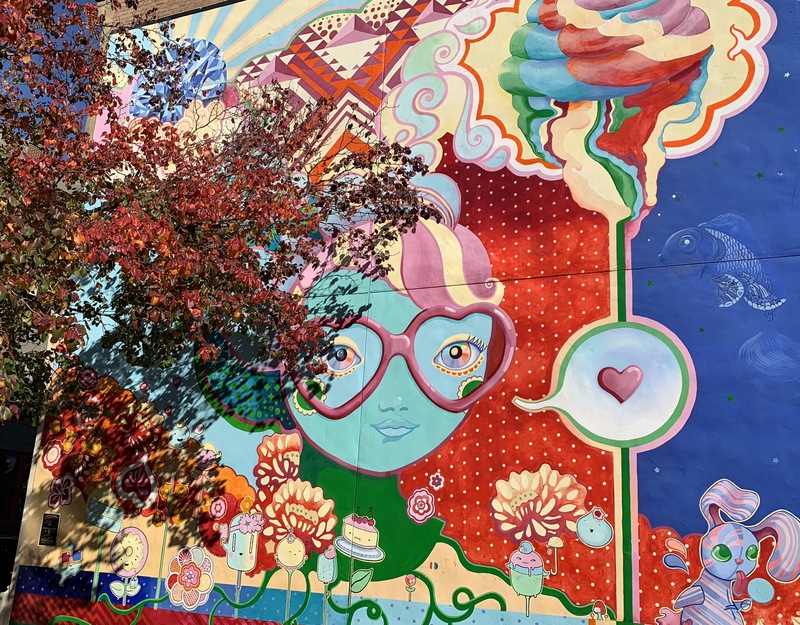 Artworks, the organization responsible for painting most of the murals, employs and trains local talent to create these larger than life paintings. 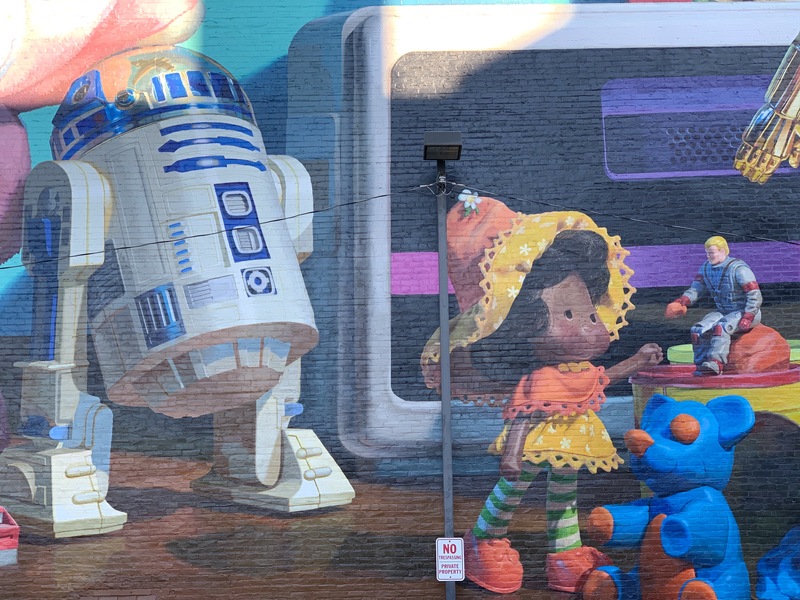 As a teacher- and a fan of Cincinnati- I love that young artists are transforming this city! Part of what made our experience so great is the staff. The staff at Pedal Wagon is truly professional. Both our driver and tour guide were personable, kind, and funny– we adopted them into our group pretty quickly. At times, we stopped, got off the wagon, and walked to various murals. Each time, our guide gave us specific details about the history and painting of each. He also knew quite a bit about Cincinnati architecture and answered our questions with ease! 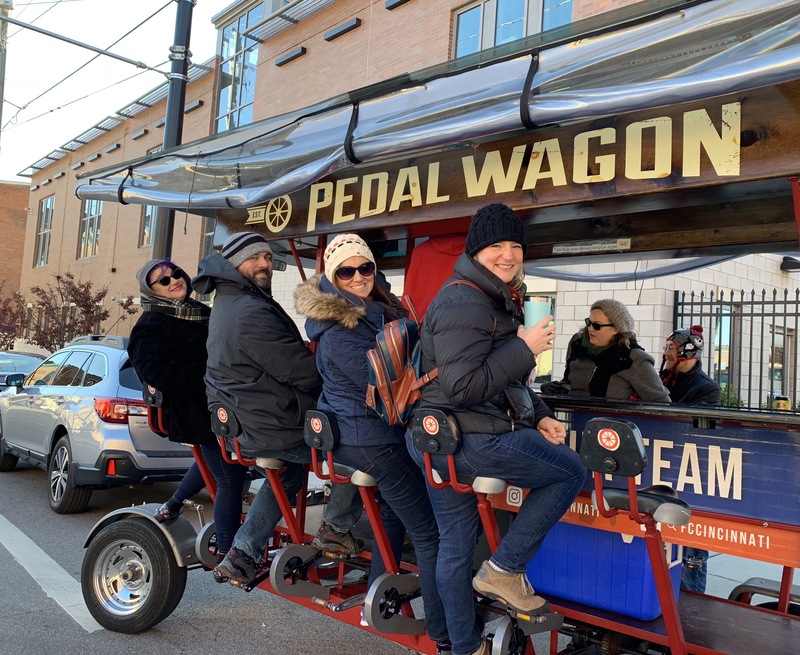 In addition to admiring all the creative talent in our city and developing a deeper appreciation for ArtWorks– the Pedal Wagon is a great opportunity to spend time with friends in a super creative way. We laughed, picked on each other for not pedaling fast enough, sang along to music (bring some tunes), waved at passersby, and took tons of pics. One of my friends said she really enjoyed leisurely watching as the city rolled past us; it’s a much different experience when you aren’t worried about traffic, street names, and parking spots. This crew is Lookin’ Good! Don’t let cold weather keep you from booking a Pedal Wagon tour. We went out in 35-degree weather and it did not dampen our day at all; in fact, we BYOB’d some hot cocoa, coffee, and chai tea as we snuggled in our winter jackets and pedaled away- it was perfect. 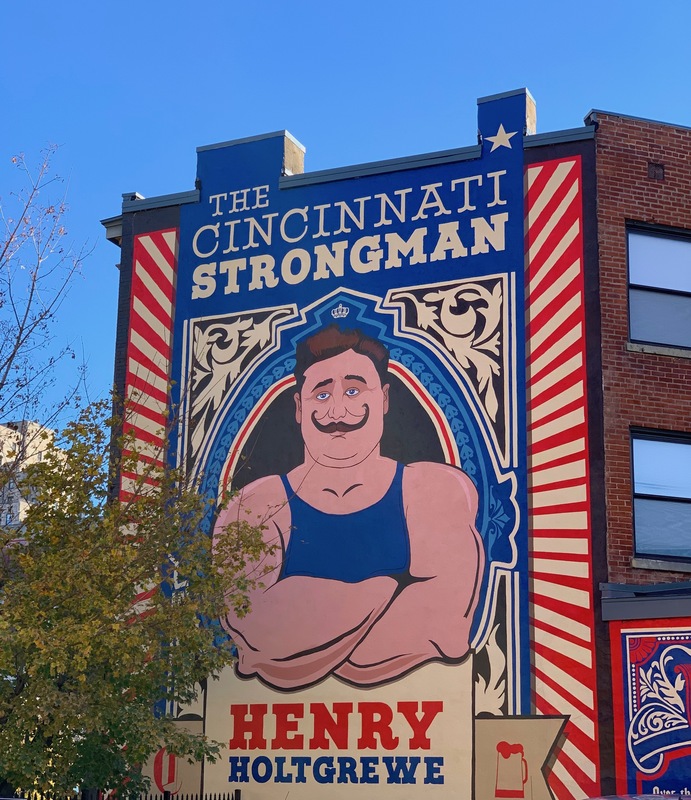 There really is something for everyone- history, art, Cincinnati, being with your people, and more. 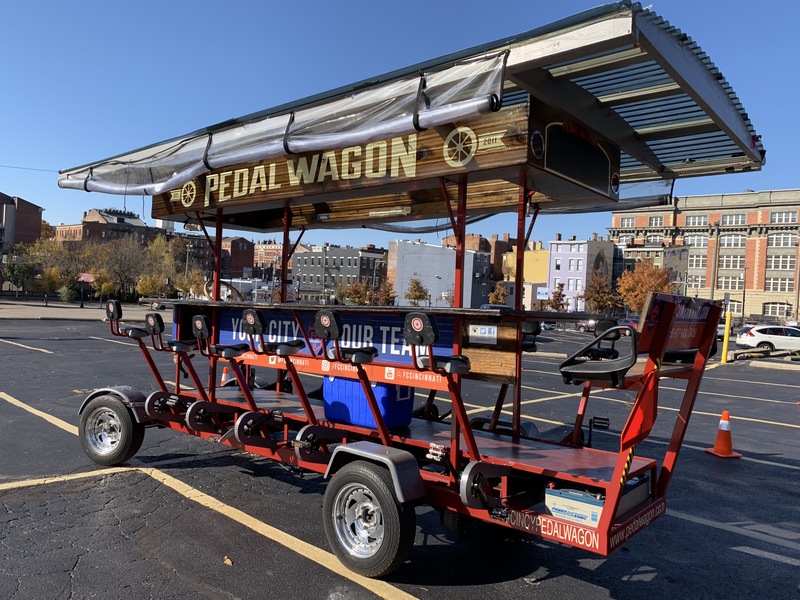 Check out the Cincinnati Pedal Wagon website for options. The Mural Tour is still happening, and the Polar Express is gearing up to go. 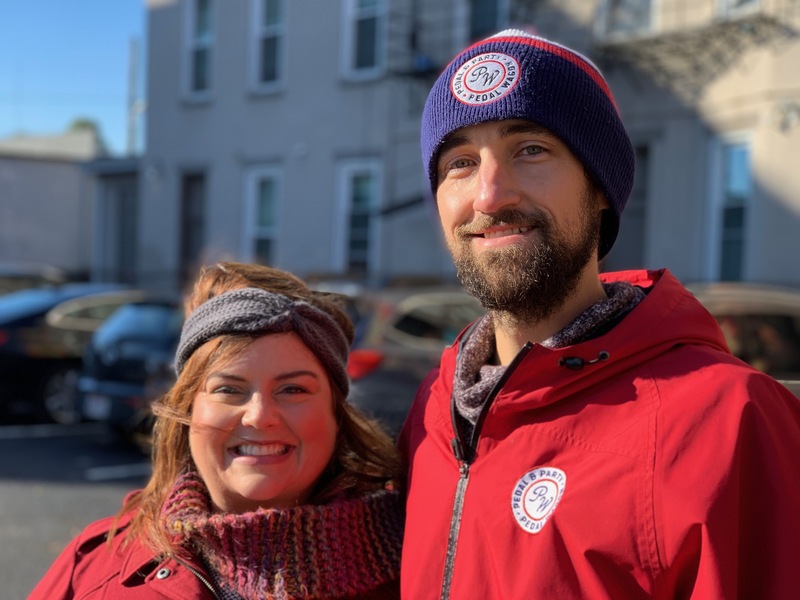 The guides are also pretty flexible, so even if you’re doing a Progressive Dinner tour and would like to add in some historical landmark stops along the way, they can make that happen. 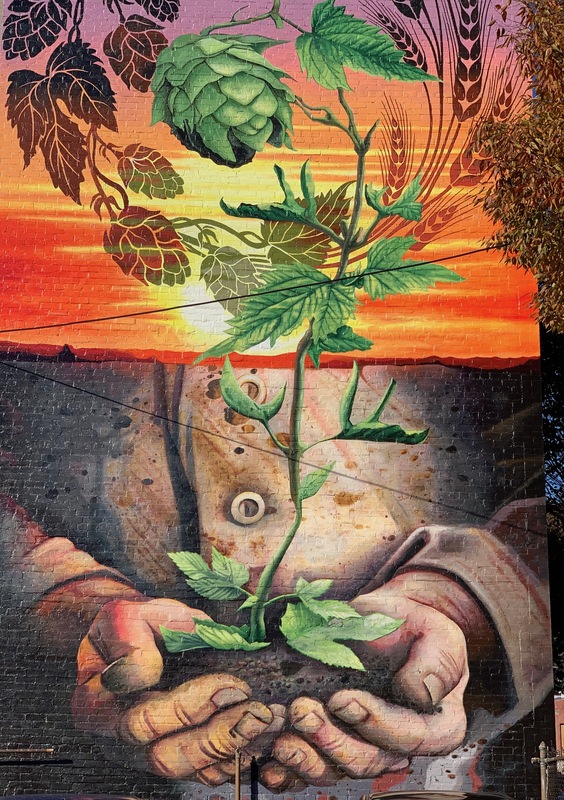 P.S.- I am only posting pics of a portion of murals covered on the tour! To see the rest and to learn the meaning of each, you need to sign up. And, as always, if you like what you read here, please share! GO THERE (Cincinnati Pedal Wagon)! 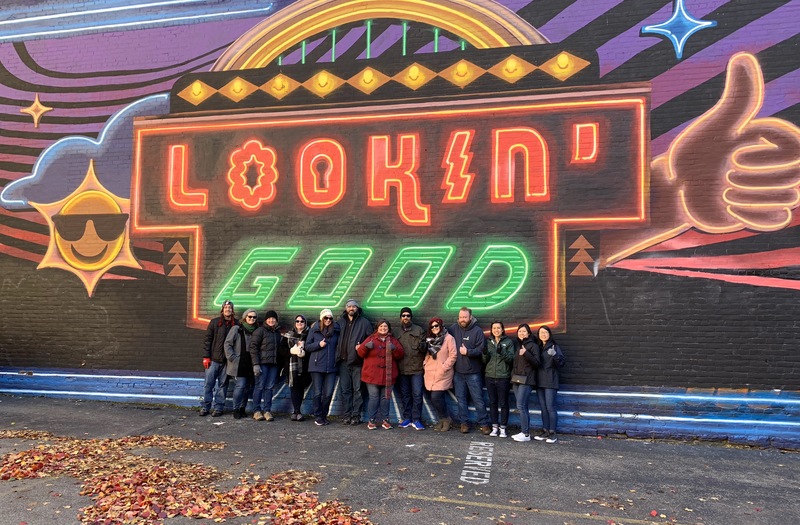 TRY THAT (Mural Tour)!